Did you know only 51% of graduates are working jobs that require their degree? One of the major contributing factors is that students do not know what they want to do when they graduate from high school or college. Due to the digital age, we associate happiness with pleasure. I mean how couldn’t we? Through digital marketing ads and “likes” from friends via social media, we begin to associate those “things” and “labels” to happiness. However, happiness is not a result of pleasure. It is the pursuit of a worthwhile goal by having a clear understanding of your purpose. 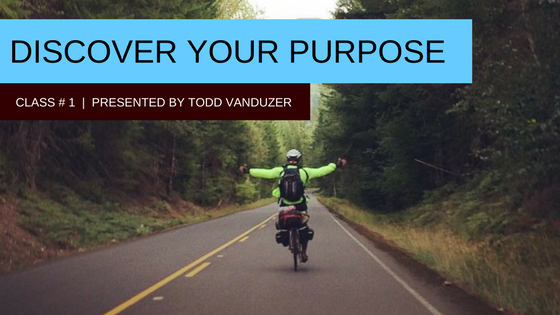 In this class, I, Todd VanDuzer the CEO & Co-Founder of Student-Tutor, dive into helping students discover their purpose ( a system I developed 7-years ago over a 3-month backpacking trip in Eastern Europe) to pursue a worthwhile goal that brings happiness. Using proven methods and scientific research on the Neocortex and Lympic (inside) part of the human brain, together we analyze “why” each student does the things they do, “how” they feel accomplished, and “what” the basic nature is in the things that they love, to discover their purpose. When students discover their purpose, they will pick degree options and jobs that are more in line with who they are. This will decrease the chances of studying for 4-years on education they will never use, spending thousands of dollars, and taking jobs and internships that don’t line up with their true passions. “I have just seen a light inside of her that has gotten even brighter… and I know it is because of this.” – Karen Millerwise, Parent of Student Who Took This Class.